STOP PRESS: IMPORTANT: The Yorkshire Three Peaks route was changed during the winter of 2012 after a number of challengers ended up waist deep in boggy ground. Instead of crossing Todber Moss, Black Dubb Moss and Red Moss, it now goes south of Hull Pot to cross Whitber Hill, Sell Gill Beck, Sell Gill Hill, Jackdaw Hole and Penyghent Churn to rejoin the original route on High Pasture. Our definitive route guide has been amended to reflect this change - so don't risk attempting this walk without all the latest route information. STOP PRESS: GPS Waypoint Data in both GPX (.gpx) and Text (.txt) format now available for The Yorkshire Three Peaks Challenge Walk. STOP PRESS: Our route guide now includes section timings (which take account of the fact that going up hill is slower than going down) so you will know whether or not you are on schedule to complete the walk within the required 12 hours. NB These timings have been adjusted to account for the new, slightly longer, version of the route established at the end of 2012. STOP PRESS: We have been advised that the safety service run by the Pen-y-ghent Cafe has been temporarily suspended. The Clock Card service however is still available. Whether you call it the 3 peaks of Yorkshire or the North Yorks 3 Peaks, The Yorkshire Three Peaks Challenge Walk from Horton in Ribblesdale Walk ny101 The Yorkshire Three Peaks) - comprising Pen-y-ghent 694m (2277ft), Whernside 736m (2415ft) and Ingleborough 723m (2372ft) is one of the oldest established walks in the UK. 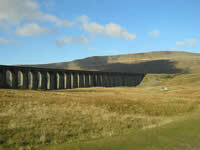 Despite its popularity however, The Yorkshire Three Peaks Challenge Walk remains 'unofficial'. It is not marked on Ordnance Survey maps for the area. It is not marked on the ground for the vast majority of the route, and, after the wet summer of 2012, the route was changed to avoid the boggiest ground - making it slightly longer. By tradition the grueling 38km (24 miles) must be completed within 12 hours though the actual time taken will vary depending on the stamina of the individual and the prevailing weather conditions. The time you take will also depend on the quality of your Yorkshire Three Peaks 2013 Route Guide and how often you get lost! Furthermore, our algorithm for producing walk timings suggests this is in fact an 14 hour walk - so you will need to step on it if you want to complete the circuit within the required 12 hours. Fortunately, our route guide includes split timings for the major sections that take into account that fact that going uphill is slower than going down and that you will be tired and slower towards the end of the walk than you will be at the beginning. So you when you stride to the top of Pen-y-ghent, arrive at Ribblehead, reach the summit of Whernside, descend into Chapel-le-Dale and clamber up to the top of Ingleborough - you will know whether your are on schedule. The Yorkshire Three Peaks Challenge Walk is a rugged, high mountain walk over a variety of terrains and should not be underestimated. Whilst the walking is generally pretty good it is very long for a single day's hike. 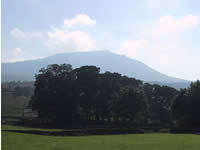 It also includes three big climbs totaling 1614m (5297ft) of ascent with the last climb up onto Ingleborough - when the legs are tired and the spirit is weak - being particularly steep. As with all mountainous areas, the weather can change frequently and very quickly. Swirling mist can descend with little warning and heavy rain can turn hard ground into stamina sapping bog - though this has improved somewhat after the 2013 route diversion. Everyone without exception attempting The Yorkshire Three Peaks Challenge Walk should be fully prepared, fully equipped, carry suitable maps for the area and a fully detailed, up-to-date Yorkshire Three Peaks 2013 Route Guide. The map you will need is Ordnance Survey 1:25000 series Explorer Map OL2 Yorkshire Dales - Southern & Western Area. Important: The route of the Yorkshire Three Peaks Challenge Walk is not marked on the Ordnance Survey map, and it is not marked on the ground much either, so every member of your party must either already know the way or carry a good detailed, up-to-date walk route guide. Our experience suggests that groups of Yorkshire Three Peaks Challengers tend to get strung out along the route as the leaders press on for a good finishing time and the slower members of the party start to tire. The go4awalk.com Yorkshire Three Peaks Challenge 2013 Walk Route Guide includes full, easy to follow route instructions - complete with downloadable GPS Waypoints (in both .gpx format and .txt format) that you can upload direct to your GPS Device and split timings so you will know whether or not you are on schedule to complete the walk within the required 12 hours. Account holders can download it from this link - ny101 The Yorkshire Three Peaks. With most books & on-line guides being several (or more) years out-of-date - and more importantly, describing the wrong route! - we believe our 2013 route guide for The Yorkshire Three Peaks Challenge walk is the clearest, most up-to-date route guide you can get. It is also probably the lightest one to carry - which might just be important as you approach the steep climb up Ingleborough at mile 18! Besides, along with your footwear and your fitness levels, the success of your whole day will depend on the quality of the route guide you have with you - so download it now and don't leave it to chance! Feedback from fellow challengers has suggested that the best approach is to download a copy of our route guide now (for planning and appetite whetting purposes) and then download a 2nd route guide just before you go. Since we regularly update all our route guides with user feedback this will ensure you are walking The Yorkshire Three Peaks Challenge Walk with all the very latest information. As well as the Yorkshire Three Peaks Challenge Walk, an account with go4awalk.com offers access to all the other superb walks on this award winning site including all the best routes in The Lake District, The Peak District and Snowdonia as well as plenty of other superb walks in the Yorkshire Dales, The Brecon Beacons and beyond. Hill Skills > What to Wear > Footwear. Good Luck and enjoy it (you will). Remember, this is supposed to be fun (it is).